Why buy a Draftmaster or Topper Rack? 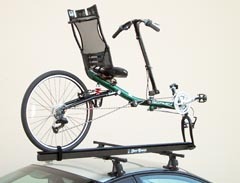 Models for Every Kind of Cycle - We make racks to carry bikes, trikes, tandems and recumbents. If you have to pedal it we probably make a rack to carry it. All Features Included - Quick installation, easy loading and gentle treatment of your cycles is standard equipment with a Draftmaster or Topper Rack. Extra parts or expensive add-ons are not needed. Best Materials and Construction - We use our own high-strength aluminum custom extrusions for the best blend of strength, weight and functionality. Our products are specifically engineered for their intended use. Quality Throughout - Every Draftmaster and Topper Rack is manufactured in the USA by our own employees. Our hands-on approach guarantees our racks will give years of trouble-free service. Largest and Most Experienced Specialty Rack Manufacturer in the US - Atoc is the #1 source for racks for tandems, recumbents and trikes. We understand the challenges of carrying bikes and trikes of all sizes. Draftmaster® is the ultimate in receiver rack design. Our quick-connect, modular system can carry up to to five bicycles, including tandems, recumbents, delta and tadpole trikes. Need to carry a mix? Draftmaster's modular design makes combinations a snap! No other rack system is as flexible or adaptable. Unlike most hitch racks, a Draftmaster gives you full access to all your cycles at any time and you can get into your trunk or hatch without removing any cycles. Because cycles are held vertically "in the draft" side overhang issues are eliminated, plus you get better gas mileage. And a Draftmaster treats your bikes better - no frame contact points to chafe or rub. Draftmaster is the complete solution for all your cycle carrying needs. a Draftmaster can carry it. All Tandem Topper's have Atoc's pioneering pivoting fork mount system. With a Tandem Topper just one person can easily load, carry and unload a long bike. Tandem Toppers are available for upright tandems (doubles, triples and even quads), LWB recumbents and recumbent tandems. Tandem Toppers can also carry a single or other shorter bike without the need for adjustment or modification. Bike Toppers have the same high quality as our flagship Tandem Topper but without the pivot feature. Models are available in lengths for singles through recumbent tandems. For single bikes needing extra clearance for fenders, low-rider pannier racks or disc brakes check out our "High Topper" model. a Topper can get it on your roof rack.